I can't believe it's taken me this long to post a recipe for spicy brownies on this blog. I make them all the time, but it wasn't until recently when a friend asked for the recipe that I realized that I hadn't actually ever shared it here. The combination of rich dark chocolate and spicy heat has long been one of my favorites. I usually switch it up, using ground spices like cayenne, chipotle, ginger, cinnamon, and even black pepper. The idea to use Tabasco came about last year after a dinner party I attended where the host served a dark chocolate cake made with Tabasco. Before that, I'd never thought to use the spicy, savory hot sauce in a sweet dessert, but that dish convinced me to give it a try in other recipes. Here's the thing--the main two flavors in Tabasco are spice and acid, both of which work really well in dessert, especially chocolate ones. So I gave it a go, and was so impressed. 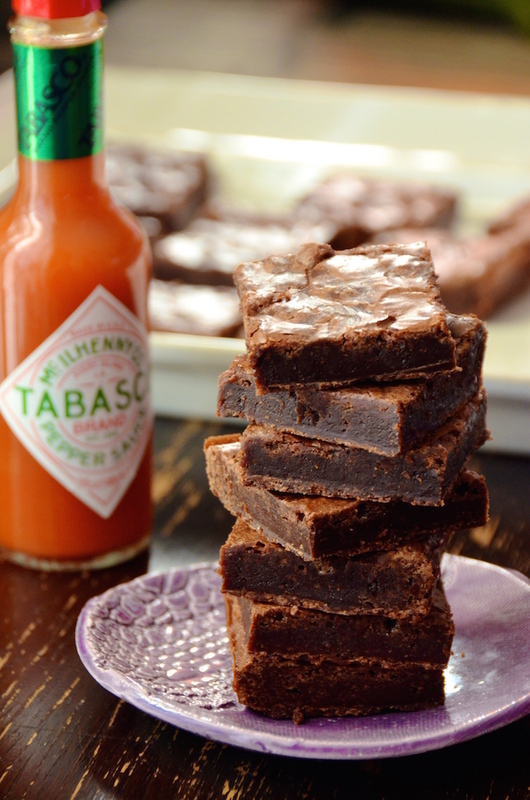 These brownies do NOT taste like hot sauce. What they taste like is deep, rich, and chocolaty, with just the perfect level of spice. I'm not sure why or how, but it just WORKS. The texture is perfect, too. Fudgy with just that amazing thin crackly crust on top. So great. 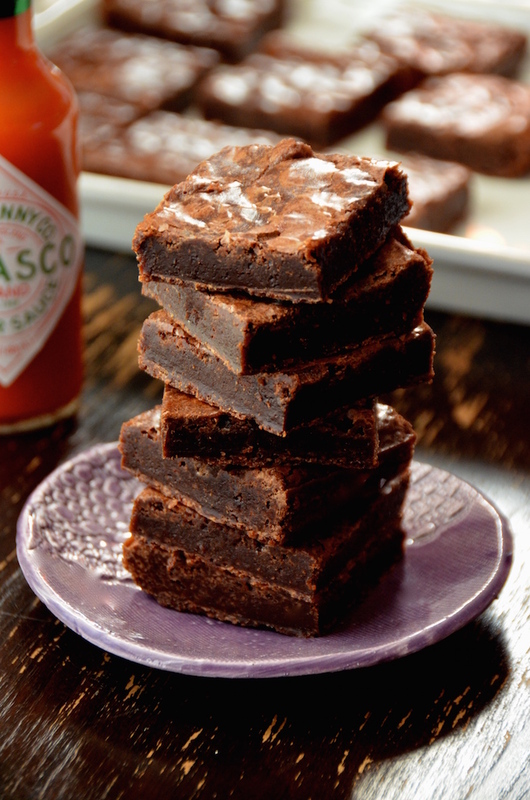 These Spicy Tabasco Brownies are one of my go-to dessert recipes when I'm throwing a party or bringing baked goods over to a friend's place. Not any trickier to make than regular brownies, the tiny little touch is still enough to turn the classic into something really special. Disclosure: This post was sponsored by TABASCO. 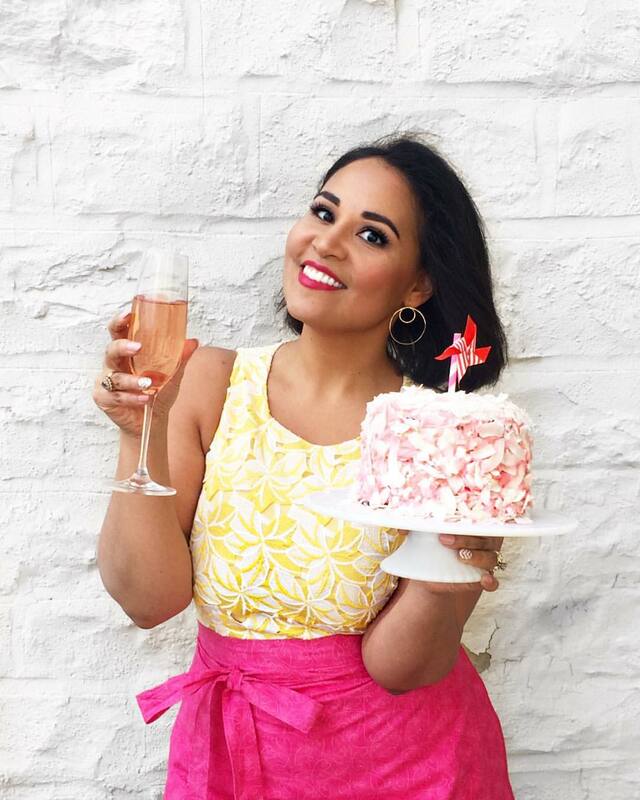 All recipes and opinions are strictly my own. Thank you for supporting great brands like TABASCO that make it possible for me to create new content for you! Preheat oven to 325 degrees. Line an 8 or 9 inch square baking pan with parchment paper so that it overhangs on the sides (foil works, too!). In a heavy bottom saucepan over medium heat, combine the butter, sugar, cocoa powder, and chocolate chips, and stir until the butter and chocolate are completely melted (don’t walk away—this can go from perfect to burned in seconds!). Remove from heat and stir in kosher salt, vanilla, and TABASCO sauce. Let cool 5 minutes, then stir in one egg at a time, beating vigorously until the egg is incorporated before adding the next one. Stir in the flour and cinnamon until batter is smooth and glossy. Pour batter into the prepared pan and even out with a spatula. Bake on the middle rack for about 20 to 25 minutes, or until set and crackly on top, but still moist in the center (a toothpick will come out with a bit of batter still on it—this is good!). Cool at room temperature, then chill in the fridge for at least one hour before cutting.